When Rana Dajani returned home to Jordan after studying at the University of Iowa, she and her family missed one important aspect of life in Iowa City: the public library. Such vital resources are rare in Jordan and much of the Arab world, yet Dajani knew firsthand how they spark creativity and a love of learning in children. "People in the Middle East read on average half a page a year, compared to Americans who read 11 books a year," she says. "Reading is essential to the development of a child's personality, imagination, brain, and communication skills. To reap its benefits, children must learn to love and enjoy reading." 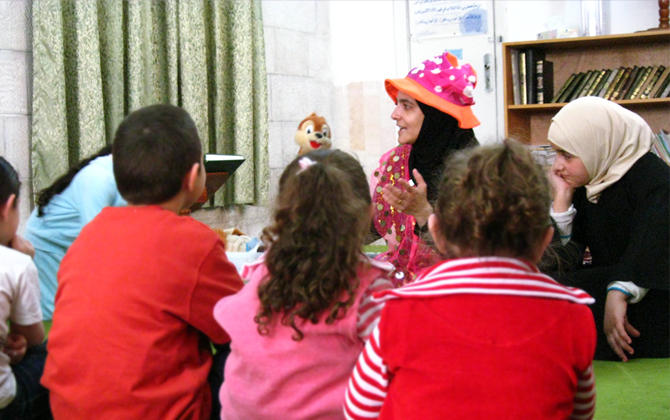 Rana Dajani reads to a rapt audience of children in a mosque in Jordan. To learn more about Dajani's social activism and her efforts to establish libraries across the Arab world, visit www.welovereading.org. Now, they're doing exactly that, thanks to an organization called We Love Reading (WLR) that Dajani, 05PhD—a biology professor at Jordan's Hashemite University—set up in her spare time. The project started out modestly in 2006, when Dajani started holding weekly storytelling sessions and set up a small library for a few dozen neighborhood children in a local mosque. She selected books that related to the everyday lives of children, and she read aloud with dramatic flourishes that captivated her young audience. Soon, parents reported that their children dragged them out of bed to attend the Saturday morning events. Today, WLR serves some 4,000 children and has spread to 100 communities across Jordan, as well as to other countries, such as Egypt, Thailand, and Azerbaijan. Dajani has also received national and international recognition, including nomination for an award from Queen Raina of Jordan that honors volunteers making a difference in their communities. While the tools—books and stories—are simple, WLR's goals are lofty and far-reaching. Ultimately, the organization aspires to change an entire society's attitude to reading and to improve the lives of women and children who are often marginalized, victimized, or ignored. Through WLR's work, children acquire literacy skills that lead to better jobs and economic security, while women who are trained as storytellers gain respect, authority, and influence as community leaders. "This comes at the right time in light of the changes seen with the advent of the 'Arab Spring,'" Dajani says. "We Love Reading will ride the tide of change and take the Arab world to a new level." One where books are widely enjoyed, respected, and loved.